Following my post a couple of weeks ago about getting back into Magic after a bit of a winter hiatus, I’ve been fiddling with building some decks for Standard, mainly because I found out my local store has a bit of a Standard thing going on on Sundays now. Of all the formats of Magic, I think I like Standard most because it feels so fresh and new – while people seem to pick a deck and just play that one all the time in Modern and/or Legacy, Standard forces you to re-evaluate your cards every so often that, while it can be both expensive and sometimes frustrating to see a combo you love rotate out, I think is nevertheless important to keep the game healthy and alive. 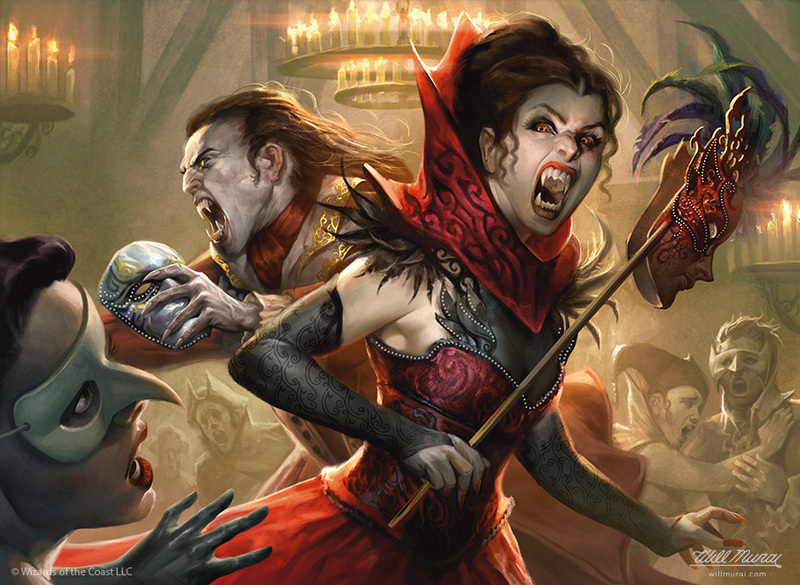 I’ve talked about a number of decks on this blog since getting into Magic a few years ago, but I don’t think I’ve yet shared any of my favourite type of decks: red/black aggro! So let’s get to it now, with my first glorious return to red and black vampires! The deck tries to be very fast, with an abundance of instant-speed combat tricks that are the exact sort of thing I love to play. As per usual, I’d decided that I wanted to build a deck around a particular legendary creature, and as Olivia is the only red/black legend in Standard right now, she was the natural choice for me. Her ability to discard a card to give creatures a +1/+1 counter and haste when they enter the battlefield led me pretty easily down the route of making a Madness deck, however there aren’t that many cards with Madness that I wanted to include in the deck. All told, there are four cards with a Madness cost – two copies each of Stensia Masquerade and Alms of the Vein – but there are eight additional discard outlets all the same. However, these additional discard outlets aren’t just there to enable Madness; they work fine without ever triggering the ability, but if I can discard Alms of the Vein and get its effect for just one mana rather than three, the fact that this can also pump my Ravenous Bloodseeker and potentially cause a nine-point life swing isn’t going to be overlooked! The majority of the instants are the usual direct damage or combat tricks, and in the main do very similar things. I try to go for as much redundancy as I can when building a Magic deck in general, due to the number of cards that can force me to discard/exile every copy of a named card throughout my deck. I’m not sure if there are a lot of those in Standard right now, though it’s just a habit that I’ve gotten into and, if there are two or three cards that do broadly the same thing, then I like the variety it gives to my deck, also! I do want to mention some of the Eldritch Moon cards that are in here, in particular Borrowed Malevolence, which is not only a great name for a card, with wonderful artwork, but I like the fact that it can either be removal or a pump, or both. The versatility is really great, and the only real reason I haven’t included its red counterpart, Borrowed Hostility, is due to the fact there are plenty of other red spells that do the same thing already in the deck (plus the escalate cost seems much more expensive!) Borrowed Malevolence was in my pre-release pool, and I had been hoping to get some cool new mechanics to try there, but in the event drafted blue/white spirits, and it had no place. So I’m looking forward to trying that bad boy out once I get to playing with the deck! 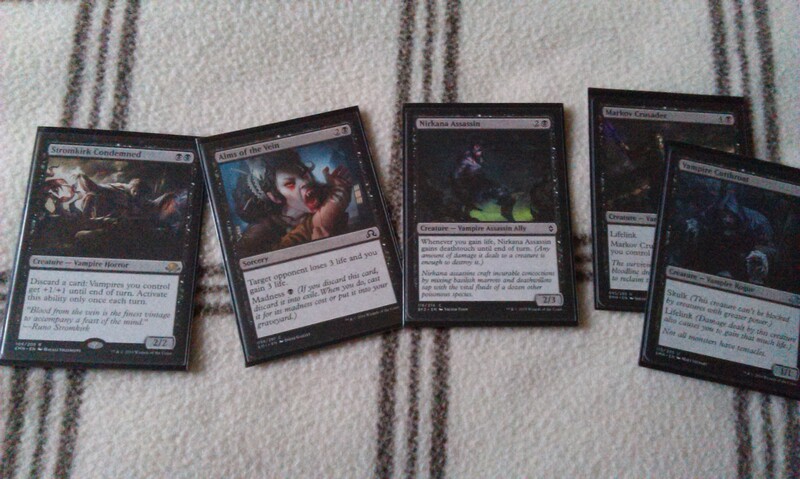 Remember my mono-black vampires deck, from back in the day? Well, I’ve been reworking that into something that I could also take down with me for these Standard Sundays! It’s a deck that I really love, with a focus on directly attacking the life total rather than combat, and while it lacks some components that a black/white deck could achieve, I’m still happy to keep it mono-black for the time being. Times may change there, of course! As I said, there are a couple of things I’d like to tweak to make it a black/white thing, as I think Cliffhaven Vampire and Drana’s Emissary could be really useful here. We’ll see where the fancy takes me, though! Stromkirk Condemned is a really exciting card, to me. Giving other Vampires +1/+1 for discarding a card is really useful in an all-vampires deck, of course, and having a playset of Alms of the Vein gives me four cards that I would be more than happy to discard for the effect! You know when you’re flipping through your collection to see what cards you have that could be fun to build a deck around, then see the card that you just need to include? Well, that’s what happened when I saw this bad boy in my collection at the weekend! So we’ll see what good stuff he can do for me. Author spalanzPosted on March 7, 2017 March 8, 2017 Categories board gamesTags card games, deck tech, deckbuilding, Eldritch Moon, game day, Magic the Gathering, Vampires2 Comments on Red-and-black for Standard! First of all, for the uninitiated, Wizards of the Coast holds pre-release events across the world the weekend before a new set goes on sale. 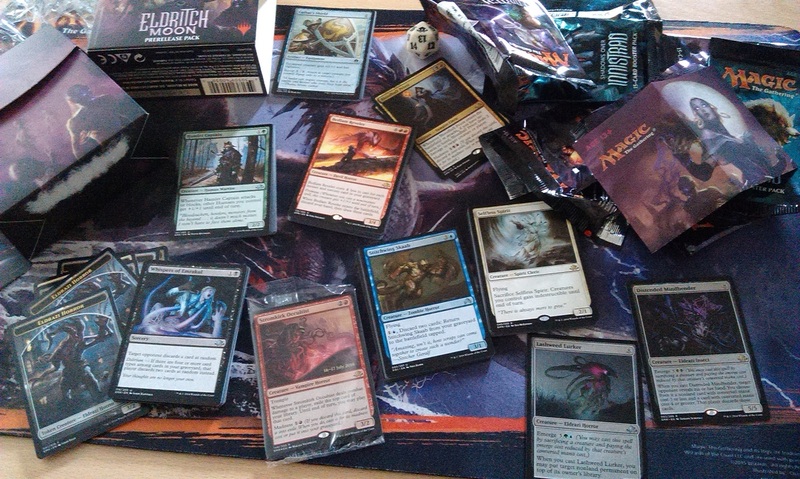 It’s a very casual Sealed-Deck tournament, where you get six packs and a foil rare, and basically get to build a deck from the cards you pull from those packs, then play a number of games. Before the set goes on sale, this is the only way you can get your hands on the new packs, but given that the packs aren’t actually legal in any deck until the set is released, I think the main draw here is getting to play with the cards a week early. I’d been telling myself I wanted to try this format since getting into Magic a year ago, but for whatever reason kept missing out. In fact, my first proper experience with the game was walking into my local store on Origins pre-release day, so I suppose there’s a nice kind of synergy there! Anyway. 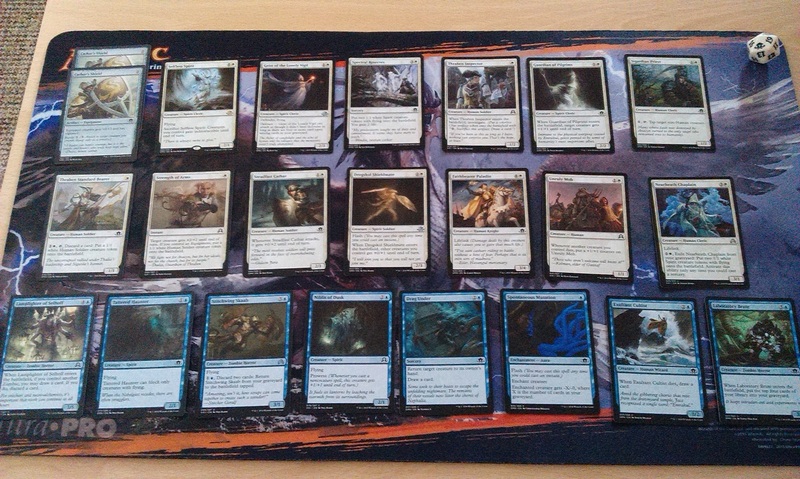 Got my pre-release pack, and I’d made sure to bring sleeves, a playmat and dice, so I was ready to go from 10.30. 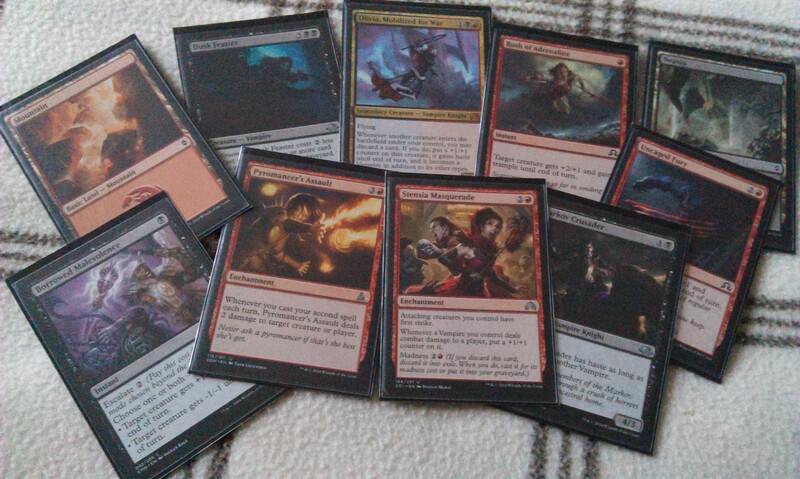 I opened up all of my packs and sorted them by colour without really paying attention to anything I was getting, but had hoped prior to the event to draft black/red vampires, as I think it would be the archetype I would be most comfortable with. I also had an idea of what I didn’t want to play – blue/white spirits. Well, whaddaya know happened… urgh! I’d thought I might have enough to get black and red going, which would let me use my promo Stromkirk Occultist, but none of the cards I’d pulled would really work together, and I thought it would be a risk to try to force it. Looking through the rest of it, I didn’t have enough blue to get blue/black zombies, and in desperation it came to me: I had enough good cards that would work together in blue and white to get a mostly-flying deck going on. Urgh! After that trauma was dealt with, and the deck was sleeved, I tried a couple of first-turn-hands and I thought it looked reliable enough. But the first round went awfully. I was up against a black-green horrible thing that kept getting The Gitrog Monster out. I managed to play a Spontaneous Mutation on it that reduced its power by 8, but still lost due to the amount of zombies and stuff that were coming at me. Second game was a similar story, so it wasn’t the best of starts, but I’d now seen a lot of my deck and, while I knew what it wanted to do when I put it together, I think I understood it much better having played it twice, so it was a useful start, even though I was down 0-1. Second game was against a white/green monster of a deck. There were humans and werewolves, but the reason it was monstrous was because it must have had at least 60 cards in there. Anyway, my second opponent was much more chatty and, in talking with him over the game, I relaxed into the whole thing, which I think made me feel much better about being there. The first game was over pretty quickly as I was attacking with my fliers while he had nothing to block; Stitchwing Skaab and Niblis of Dusk for 5 damage each turn, which was good but I kinda wish I’d been able to play with more of the new Eldritch Moon cards. There were a couple of mis-plays, but I managed to win, which totally surprised me! The second game of this match was going really well for me, as he was mana-screwed for most of the game, so I kept attacking unopposed, but then everything came crashing down with one of the green werewolves that transformed – I don’t remember which one, but it was something horrible that was equipped with stuff that made it pretty scary! However, by the time this thing came up, my opponent was at one life, so I blocked the wolf with Geist of the Lonely Vigil (equipped with a Cathar’s Shield), and buffed it with Strength of Arms, which allowed me to create a 1/1 Human Soldier token that I used to attack on my next turn to defeat him. It was pretty epic in those final moments! I felt curiously guilty for winning, but at least things were going in my favour at last! 1-1, time for round three. Third match was against another of these veteran-types, another green/white deck with humans that I was kinda nervous going up against, if I’m honest! I mean, my opponent just knew what he was doing, and it really put me off balance! I lost the first game really quickly, so was thinking my time was over and I was about to just get stomped. However, game two saw him mana-screwed, I think he only drew three lands all game. It felt pretty dirty, but I won! So we were drawn, and went into game three again with me feeling like I was about to be wrecked, but again, he got mana-screwed and I won! I couldn’t quite believe it! The worrying thing for me, however, is that he was getting really angry with his deck and I didn’t quite know how to handle it. I mean, it’s only a game, right? So I just played and hoped to be as graceful as I could. Luckily, Tony was sat behind me, so we could kinda talk after the game and compare notes etc, but I was really uncomfortably aware of the fact that this guy was still sat there, chundering away to himself and shuffling and re-shuffling increasingly angry, drawing practice hands and then shaking his head again. Urgh! At this point, I’d played seven games of Magic with a deck that I wasn’t exactly happy with – I mean, blue/white spirits is not my ideal deck. So I was actually thinking I might just toddle off at that point, leaving with my record at 2-1 and thinking that the experience was much more important than actually winning anything, but there was only one more round, so I just went back into the fray! My last opponent was someone I’d met earlier after he had played Tony, and he was another fairly chatty guy, so it was a good way to end the day. Unfortunately, I also knew him to be really good, so I wasn’t expecting to win. He was playing a very fast red/white deck, with a mix of humans and werewolves, though I thought it interesting that his white creatures were similar to mine, so it sometimes felt like a mirror match situation, when each of our Steadfast Cathars were attacking, equipped with Cathar’s Shields. I was more interested in his deck, however, because I think he was the only person in the tournament who had pulled both parts of a meld pair and was playing them! Unfortunately, both games we played did not see either half – and also unfortunately, I lost both games! However, I was so excited to see some new cards, I convinced him to play a third, more casual game with the deck, just in the hope of seeing the two cards come together! Unfortunately, neither Hanweir Battlements nor Hanweir Garrison came into play in all of the three games, so that was disappointing! Overall, it was really fun. I think the experience of making a Sealed Deck and then playing with it was good, though more than a little daunting, especially the thought of playing all those folks who knew what they were doing! I missed a few things, but I felt pretty good about being able to help other folks, especially with the new rules! Definitely had a community vibe to the whole thing. I wasn’t entirely happy with the deck I had, as I was playing colours that I wasn’t entirely comfortable with. My actual pool was pretty bad, as I said, but I’ve heard a lot of folks around the store saying similar things – not sure whether they’re trying to save face, but yeah, I felt somewhat better knowing I wasn’t the only one! So yeah, I went 2-2 all told, and placed 11th out of the 20 competitors at the game. Which was just so amazing, because I’d thought I was going to come dead last! Tony placed 18th, only winning the last of his four matches, but we both got to come away with two boosters each! I opened them later, and they also had nothing of interest in there, but I plan to go over all of the cards in the coming days so that I can try to make more sense of them now that they’re in hand! It was also really cool to get to talk with some folks who play Magic with a lot more regularity than myself. The second guy I played is very casual like me, and we got to talking about the types of decks etc, and he told me people actually play paper Pauper at the store! I was so excited for that, I’ve since built a Pauper Mardu deck in the hope of trying it out sometime! Commander is also really popular there, and I spent the best part of Sunday putting together a black-white Ayli lifegain deck that I really hope I can try out soon. Anyway – the moment you’ve all been waiting for: it’s my deck! So there you have it! The thought I had with this deck was to have lots of little people out to run interference, and basically wear my opponent down. I’m not used to playing these kinds of decks, as I tend to have better little people in my black/red decks, but these things can’t be helped I guess! I had a few of the new cards as well, which was fun, though time and again it was the Shadows over Innistrad zombies who were providing a good deal of the action for me. I’m pretty pleased with how the day went, anyway, so let’s see if I get down to the Kaladesh pre-release coming in September! 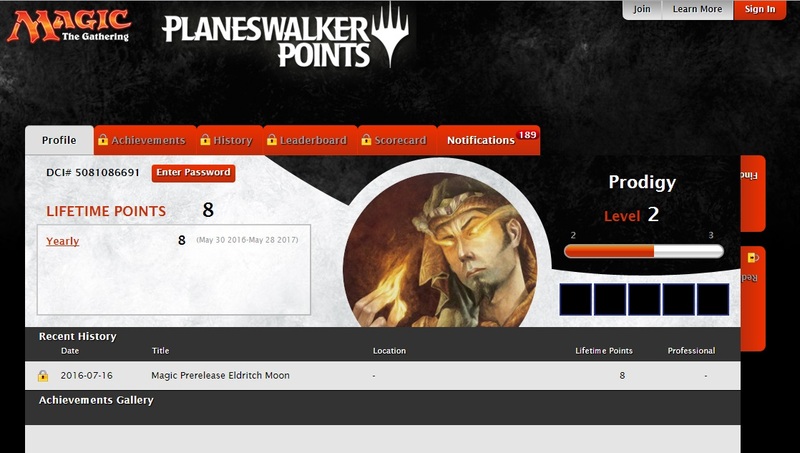 Author spalanzPosted on July 19, 2016 March 5, 2017 Categories board gamesTags card games, deck tech, Eldritch Moon, game day, Magic the Gathering3 Comments on Eldritch Moon Prerelease! When I first watched this video, I wasn’t convinced. I mean, it just felt way too gimmicky for my liking, and I didn’t think I would ever want to bother with it. I mean, sure, the card is a beast when you can get it melded, and recent spoilers seem to support that other cards will be similarly insane, but I couldn’t really see me playing a deck with these things. I’d much rather have won the game by the time any such meld shenanigans could have happened. But I’ve been mulling it all over today, and I think I might be convinced. Thematically, however, I think it’s really cool as a demonstration of the insanity that has invaded Innistrad after Emrakul’s arrival. It’s a crazy mechanic, let’s make no mistake, so entirely fitting with the craziness that’s going on there! I’m scared for the pre-release, of course, but I’m also more than a little bit excited now, I have to admit! Author spalanzPosted on June 28, 2016 Categories board gamesTags Eldritch Moon, game day extra, Magic the GatheringLeave a comment on Eldritch Moon spoiler season!